As a member of DC Network you will become part of our supportive community, and will have access to all our resources. You’ll be joining the largest specialist donor conception support organisation in the world! Join here. As a new member we’ll send to you by post (or email if you live outside the UK and Republic of Ireland) some Welcome material – a copy of our latest Journal, information about current events, a list of materials in our library, and a contact list. This is a list of other members who have volunteered to be available on the phone or via email. They are listed by geographical area with details of their family set up and donation type, so there is likely to be someone near you who shares your situation. You can be in touch with them for support whenever you want. Unless you have already talked over your situation with someone from the office, you’ll receive a phone call or email from a “welcomer member” who is or has been in a similar situation to you. And we’ll ask you how you’d like to be contacted, and if we can keep you updated by email rather than post. From the library you can borrow books, films and pamphlets from our extensive collection of material on donor conception. We’ll invite you to the two day-long meetings we hold each year – one in London in the spring (usually April) and one in the autumn outside the capital (usually in September/October). In London we have around 200 people and 100 children attending. The out-of-London conferences tend to be smaller. We provide a crèche for babies and children up to about 12yrs to ensure that children can also meet other donor conceived children. We have plenary speaker sessions and small facilitated groups where members can discuss their personal issues. Also for children between 8 and 12, there is the opportunity to join a half day children’s group led and facilitated by professional consultants, allowing children to share their feelings about being donor conceived with each other in a safe setting. These conferences encourage and facilitate on-going connections and friendships between both parents and children. There are a number of local groups around the country enabling members to meet informally, and if there’s a group in your area we’ll put you in touch. You can buy from us a number of books, including our very popular illustrated Our Story children’s books for parents to read to their children explaining their origins; and the Telling and Talking booklets written specially to guide parents of different aged children. Also the professionally made film to accompany the Telling and Talking booklets. We offer two programmes of workshops around the country, one for those contemplating donor conception parenthood and another for parents to support them in ‘telling and talking’. Lesbian couples and single women are catered for in special workshops. 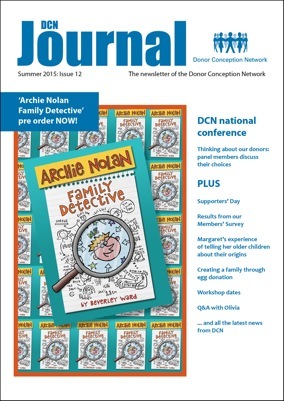 We’ll send you our DCN Journal twice a year. It contains longer articles, commentaries, personal stories and research material. The Network has good contacts with the HFEA, the Department of Health, specialist lawyers, researchers, counsellors and therapists as well as many of the senior clinicians in the UK. If you are encountering a problem, we can sometimes take up a case or at least put you in touch with someone who can help. We are also connected to world-wide networks of parents, donor conceived people, academics and others with knowledge and experience of donor conception families. These people keep us up to date with what is happening in other places and we pass on information likely to be helpful to UK families via this site and our eBulletin. £55 per couple household / £45 per single adult household (£35/£25 for unwaged), £30 for professional membership and is free for donor conceived adults. You can join here.